What the make-nice crowd wants most of all is for the Democrats to forswear any investigations into the origins of the Iraq war and the cronyism and corruption that undermined it. But it’s very much in the national interest to find out what led to the greatest strategic blunder in American history, so that it won’t happen again. What’s more, the public wants to know. A large majority of Americans believe both that invading Iraq was a mistake, and that the Bush administration deliberately misled us into war. And according to the Newsweek poll, 58 percent of Americans believe that investigating contracting in Iraq isn’t just a good idea, but a high priority; 52 percent believe the same about investigating the origins of the war. I just got home from Barnes and Nobel where I picked up his book, The Audacity of Hope. The book certainly isn’t the typical ghost-written book by a politician. It easily passed the skim test in the book store, where glancing through the book I found items which caught my interest, convincing me it is worth reading more from him. The skim test is certainly sufficient for deciding whether to read a book, but is not sufficient to take the author seriously as a Presidential candidate. 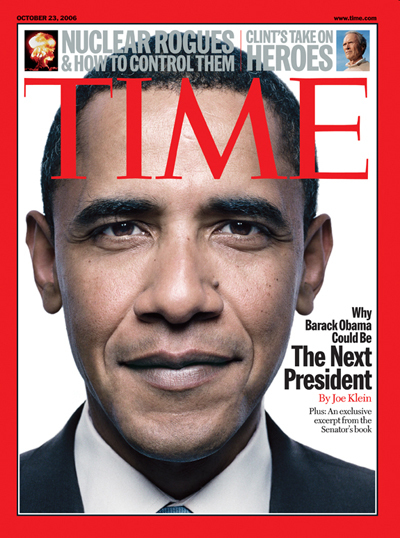 It is no surprise after the past week of Obamamania that he is now saying he is considering running in 2008. He’s made the cover of Time and in the past week I’ve had excerpts here from op-eds from three of the New York Times columnists, David Brooks, Maureen Dowd, and Frank Rich. “I’m not sure anyone is ready to be president before they’re president,” Obama said. “I trust the judgment of the American people. There certainly are characteristics of the individual which must be considered beyond experience. George W. Bush showed the problems with making someone lacking in experience president, but it is doubtful that no amount of time in government would change the fact that he was both morally and intellectually unfit for the job. It will be interesting to read through Obama’s book to help decide whether he is the type of person who would make a good President. In 2004 I read through a large number of John Kerry’s public statements before deciding he had a unique grasp of the issues which made him by far the most qualified of those running. Perhaps I’ll find that wisdom of Obama’s book, but even if it is there the fact remains that having the experience on top of the wisdom as Kerry has would be preferable. While many pundits have a variety of reasons to spin their political predictions, The Kiplinger Letter attempts to give investors and businessmen their honest predictions. The October 20 issue leads with the midterm elections, and they do not see the Republicans as doing very well. They believe Democrats may pick up twice the fifteen House seats needed to take control and warn that Democratic prospects to control the Senate are looking better. (The Washington Post today also notes that the Democrats have strengthened thier chances for taking control of the Senate). The Kiplinger Letter leans Republican but they do not share the total paranoia of Democrats as is seen in most of the right wing media. Rather than perpetuating the right wing claims that Democrats are practically socialists who will be hostile to business, they consider Harry Reid, as well as Chris Dodd and Max Baucus who would likey chair the Banking and Finance Committees, to be pro-business. Perhaps they should also point out to their subscribers who are more nervous of Democratic control of Congress how the stock market typically performs better under Democrats, and the deficit would certainly be lower than under the current government. This led to a number of attacks from right wing bloggers, such as here, who are ignorant of the amount of subsidization the right wing noise machine received to reach the point where it is today. TERENCE SMITH: Does this operation make money? BRIT HUME: No. This operation loses money. It doesn’t lose nearly as much as it did at first, and it’s — well, it’s hit all its projections in terms of, you know, turning a profit, but it’s – it will lose money now, and we expect for a couple more years. TERENCE SMITH: What does it lose in a year? BRIT HUME: I think it’s losing about $80 million to $90 million a year. Even for Rupert Murdoch, that’s not pocket change. Reaction in the liberal blogoshere to the actual news of the bankruptcy also showed that my view was typical in preferring NPR over Air America. While conservatives need to be repeatedly spoon-fed what to think, liberals tend to prefer nonbiased sources which present a wide variety of views. Of course many conservatives consider NPR to be liberal since it does provide objective information and views from the entire political spectrum rather than reinforcing their fantasies about the world. David Brooks is not very popular among liberals, but even when he is on the wrong side he often has more to say than the typical right wing writer. While we are each rooting for the other side, today I find that we have a similar analysis of where the political game is being played. In that spirit, the National Federation of Republican Assemblies set out to rid the party of this threat. It set up a “RINO Hunters Club” to “root out and hunt down” the squishy centrists who are Republicans in Name Only. The Club for Growth ran candidates to defeat them. Last week on his radio show, Sean Hannity blasted the RINO’s again, saying they were costing good conservatives their jobs. Well, this is one problem the Republican Party is solving. When the next Congress convenes, there will be many fewer RINO’s in town. You look at the vulnerable Republicans and it’s like a moderate Republican graveyard: Deborah Pryce, a bright and effective member from Ohio; Christopher Shays from Connecticut; Sweeney from New York; Gerlach from Pennsylvania; Reichert from Washington; DeWine from Ohio.